Many experiments explored a writing style that scaffolds cognitive processing in a better way. Writers suggest that every writing genre does not only have a different impact but also require different cognitive resources to accomplish certain comprehension level. The structure of writing, in this regard, plays a very important role in decoding information, regardless of the fact of how much someone has read. Not only is this, changing technology became another inevitable factor that has imponderably altered the writing styles, especially journalism and mass media. Although the effects are conspicuous in every aspect of mass media domain, the news content has been improvised in terms of writing style, structure, and its organization. Focusing on the relationship between the structure of a news story and the reader’s understanding, the new writing style instantly became popular among content analysts. This is where ‘Inverted Pyramid Structure’ comes into the picture. Transforming the journalism, the new approach set its aim to develop a better understanding of any piece of information. Not only does it emphasize on improving writing structure but also the communicative quality of the information. The inverted pyramid approach revolves around some general assumptions (the-lead–and-body principal). It purports to respond to four questions ‘What, Where, When and Why’ at the beginning of an article. It was no later than Civil War (1861-65) when the style was widely accepted and adopted as a professional standard. Several significant factors foregrounded inverted pyramid journalism. Some of them were the publisher’s increasing commercial interest, economic stability, and information policy and unreliability of traditional technology. The conglomeration of these factors in the content analysis, inverted pyramid journalism became popular in mass media domain. Editors and publishers attempted to apply this systematic approach to improve the comprehensibility of a piece of information or thesis in the journalistic genre and routine. There is no denying that the inverted pyramid was a result of a professional effort to enhance and bolster the communicative quality of the content. It is important to define inverted for understanding the inverted pyramid writing style. Just by understanding the inverted definition, it is easy to analyze the pyramid structure. The word inverted refers to ‘opposite position’ or upside down arrangement. 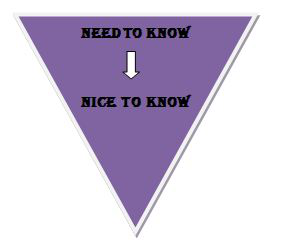 Corresponding to this, the inverted pyramid metaphorically illustrates how you should structure and prioritize the information in the text, for instance, news report. Inverted pyramid structure has become a mainstay to write stories in conventional mass media writing. The ‘base’ of the structure in the pyramid contains the most fundamental information. As the pyramid is upside down, these important and fundamental facts appear first, at the top of a news story. Following this, the lead column holds non-essential information that appears in the second paragraphs, in order of significance. Despite the fact that many media writers criticized inverted pyramid structure, it remained widely adopted and used formats because of its suitability to the mass media scripts. What Is Essential Information In Pyramid Structure? Typically, the essential information refers to ‘Five WS’ which have great importance in journalism. A successful lead column of a pyramid communicates the information of the basic level. It uncovers the essential facts like ‘who did it, Why he/she did it, When, Why and Where something was done’ in the first paragraph. The lead paragraphs contain additional information such as sources, quotes, background and statistics or information that adds value to the story. In journalism, this writing style changed the format of story structure. The writer structures the most fundamental information or what the writer considers as the conclusion first. Not only just by skimming through the text reader gets the essential information but also it saves his/her whole lot of time. The supporting details are the background information, come next to the lead paragraph to elaborate the story. Many critics have argued that there is no much difference between inverted pyramid structure and academic writing. They pointed out as abstract in academic writing summarizes the key findings, an inverted pyramid in news stories organizes content in the same way. The unique style of writing, however, has several distinguishing features as compared to formal style in academic writing. Typically, it emphasizes the details that conclude the story. Inverted pyramid prioritizes the facts on the basis of ‘what reader need to know without having to read the whole article’. Smaller details follow them just as triangle balanced towards one corner. Depicting a triangle balance, the writing style represents the content and facts, going from the broadest to the smallest details. Not only does inverted pyramid style give précised information at the beginning of the article, but also supports different readers. Those readers who have an inclination and time to read the whole article, a single sentence can easily determine the story content. Beyond this, this writing style handles the information systematically. It helps editors and publishers to cut the certain length short that suits publication. If paragraph reduces its length when you advance in reading, you can practically trim the article at any point. According to historians, inverted pyramid journalism originated before the twentieth century, specifically during the Civil War. Mass media writers were scripting the news reports in a form of flowing, long narrative. Whether it was newspaper accounts or fairy tales, every piece of writing entailed the same format. Exaggerating the stories, every newspaper account began with an indication that something entertaining, inspiring and useful will soon begin. In 1845, with the invention of telegraphs, correspondents who were covering the Civil War adopted a new reporting style. They used telegraphs for transmitting their news stories via ‘Morse Code’. However, the publisher cut those stories, most of the time, in mid-sentence. This is when the reporter realized to assemble the most important information and facts right at the beginning of the stories. It helped them transmit the main information, even if the other parts of the story were lost. Later on,’ The Associated Press’ (AP) formally established a trend by signing an agreement that news stories must be précised and brief. Interestingly, this associated press soon gained popularity because of its tightly written content. The writing style of the inverted pyramid structure originated at the same time. AP with its AP style, became one of the largest and famous news organizations. There is no doubt that even after 150 years, inverted pyramid style still has its influence, particularly in news mass media. Not only journalists have adopted pyramid structure but its serves editors and publishers also. Moreover, when it comes to benefitting readers, this smart writing structure helps them get the important information just by reading the first sentence. Benefiting the news outlets, this comprehensive structure provides them enough room to convey maximum information using smaller space. It is something very important an age when not only newspapers are shrinking but also readers are engaged in so many other activities. The evolution has been great for editors as well. They prefer the pyramid format to accomplish tight deadlines. Following the pyramid graph, editors shorten exaggerated details in the long stories from the supporting detail. The style of writing enables them to highlight vital information without losing the interest of the readers. In fact, the inverted pyramid style has more usefulness today than past. Many studies discovered that the norms of reading information underwent considerable change. Readers, now read with short attention span when they read something on screens as compared to paper. Now the medium of information is relatively small like iPad or the small smart phone’s screens. Summarizing stories as succinctly as much as they can be has become the foremost requirement of reporters. Even the online news websites contain theoretically much more room to put detailed articles, as there is no need to print the pages physically. You will see stories using an inverted pyramid or tightly written content to grab readers’ attention. 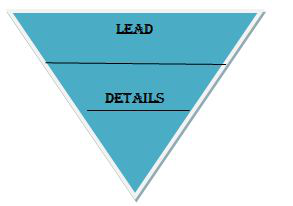 Why Should You Use The Inverted Pyramid Structure? Over the centuries, journalists have been using ap style for several good reasons. The formula successfully keeps readers engaged. It assists them in comprehending the story from the first sentence, written to attract readers and hold their attention. Readers can instantly decide whether news report interest them or not. The brief structure allows the reader to get the gist of the news story and pick up the important details, without reading it word for word. The pyramid style is very helpful when the reader knows the story and looking for updates only. Furthermore, if you are a print media editor and work for a magazine or newspaper or any other printed publication, working with inverted pyramid structure will help you smartly utilized the space. Newsletter and magazines have usually space restrictions and have to cut news stories short. By shortening the material from the background details, the inverted pyramid enables editors to highlight the important information. The style has a direct approach. That means, to grab the attention of your readers, it is essential that you harness your newspaper account with an interesting front lead. The all-in-one technique is very important to draw the attention of the web traffic. This is how can you do it effectively. As a journalist, when you write something, you should strategically use words to incline readers. Your title or first heading has to be interesting enough to engage the readers. Beginning with a creatively crafted lead, help you lead the other news websites. For example, if you report a story with a front lead like ‘Seals rob a Store’, (using Seals metaphorically) it can be an interesting way to draw your reader in. It will likely to trigger his/her curiosity to click on the news and read it on your web page. That’ is why you should construct a catchy headline. You can begin with the brief summary and can incorporate important keywords into it. It will help your readers to quickly evaluate what your news story is all about. Once you have pulled the readers by grabbing their attention, according to the inverted pyramid structure, you need to add supporting details. You might describe how Seals have robbed the store and which store did they attack or the amount of money that was stolen. This is a convenient way to allow readers to skim through the idea discussed in each paragraph. The reader can scan the content, assessing it whether it interest it or not, without reading every paragraph. Headings are important when it comes to enhancing the subject matter of the content. Always use significant words to communicate your subject matter. A well-composed heading will not only catch the reader’s eye but also help him/her skim the text. The ‘bottom’ of your news story is for elaborating context, supporting ideas, or background history. You may add some history about crimes in a specific place and how this phenomenon has affected the lives of people. Furthermore, you can add some suggestions to add some value to your story. All in all, there is no doubt that the inverted pyramid structure has positively influenced mass media reporting. Journalists learn about the pyramid graph as it helps them organize and structure news stories. Thus, it is a systematic way to communicate the fundamental information to the readers.